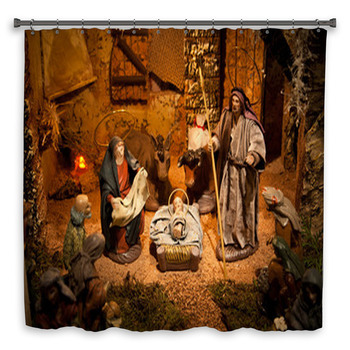 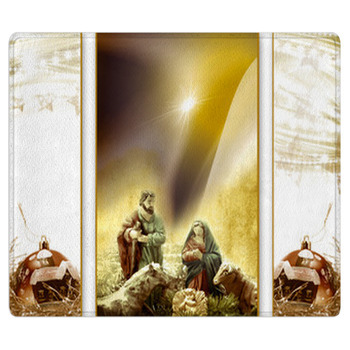 Don't forget to bring the magic of Christmas and the holiday season into every room of your home with our nativity scene shower curtains and bathroom décor items. 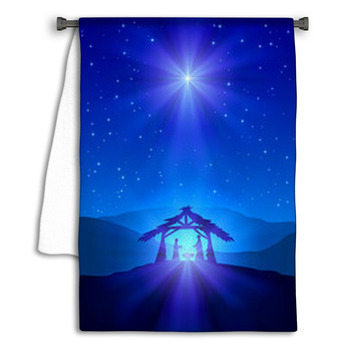 The true history and spirit of this special holiday comes to life on our collection of hand and bath towels, festive shower curtains and matching math mats. 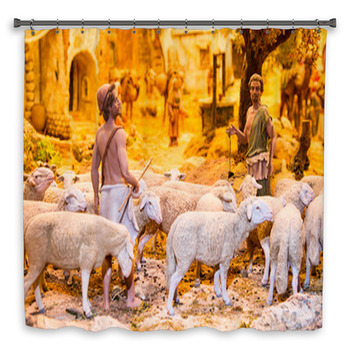 Experience your favorite time of the year throughout every room; giving your entire home the joyful and deeply Christian appearance of the holiday season is easy with our nativity scene themed shower curtains, bathroom décor and other complementing home décor items. 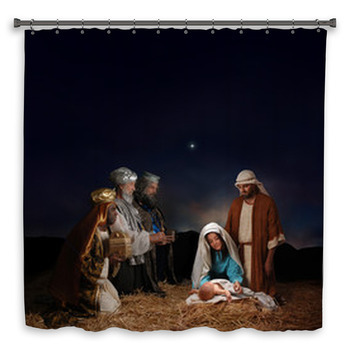 Taking a relaxing bath can be like traveling to that fateful night in Bethlehem with artistic and realistic representations of the unforgettable nativity scene. 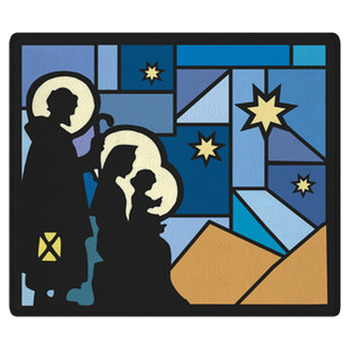 Watch the enchanted animals bow and smile before the manger as Mary sits with her newborn son and mystified husband. 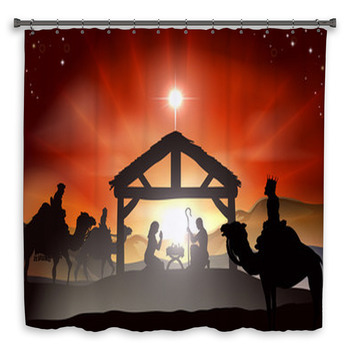 The three oriental kings can be seen making their long journey over wind-swept eastern sand dunes underneath the starry sky on your very own bath towels, perfect for personalizing with your name or a special Christmas message. 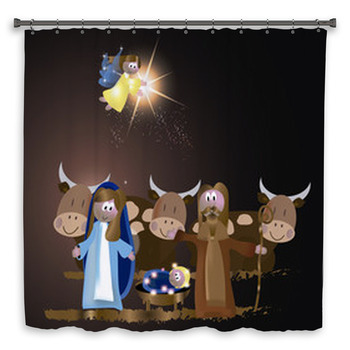 Bath mats and shower curtains for children even show the nativity scene with fun cartoon style and are a perfect way to teach them about the real history of Christmas this upcoming winter. 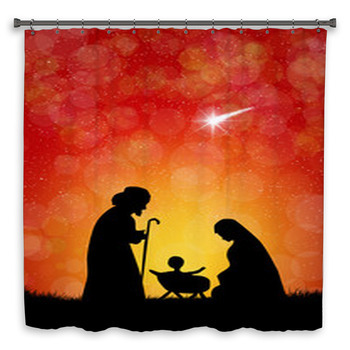 Customize our entire collection of nativity scene themed shower curtains, bathroom décor and matching items to create the perfect gifts to give to your fellow Christians this holiday season. 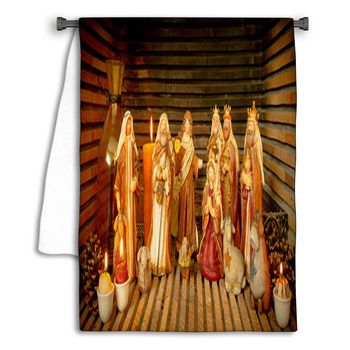 By adding our nativity scene wall art, blankets and pillows to your living room and bedrooms, you can have a complete and professionally-designed look in your home in minutes. 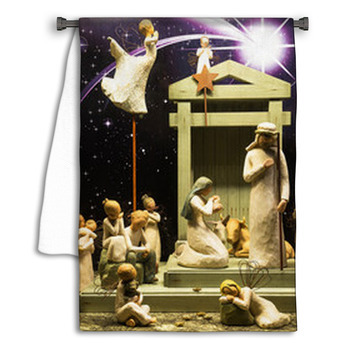 Let this season be one to remember by cherishing the holy image of the nativity scene in your home décor theme.